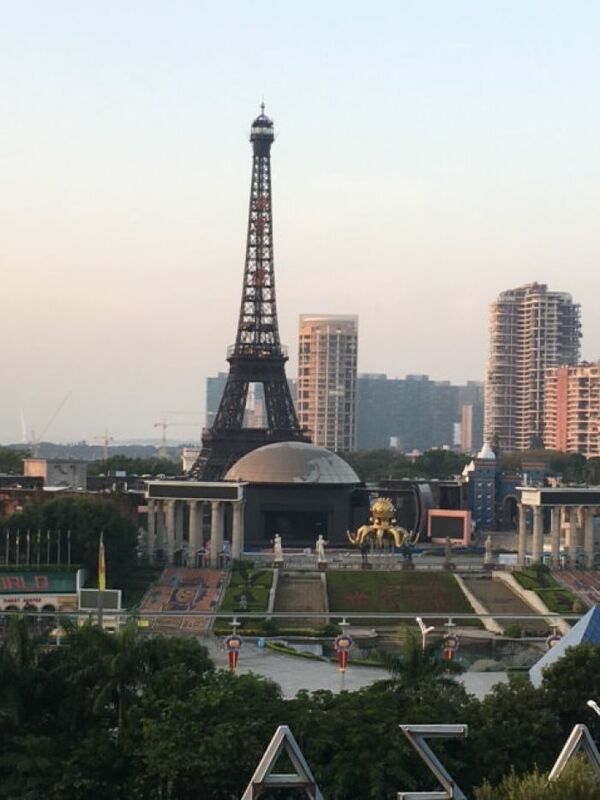 The Yitian Eiffel is one of at least three replica Eiffel Towers in China. 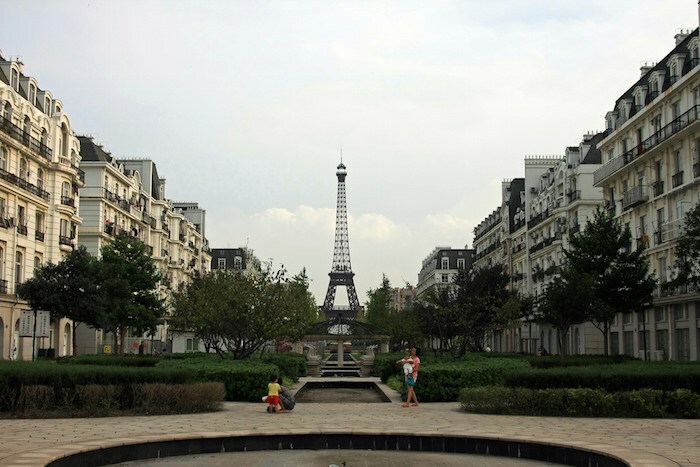 Tianducheng – A replica of the Eiffel Tower in Hangzhou, the buildings on the two sides is also based on that of the Paris. They call this a REPLICA in China. 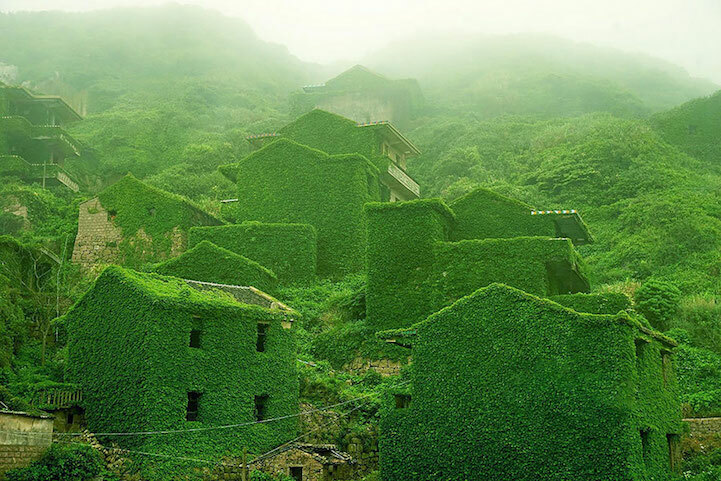 Houtou Wan Village is located on Gouqi Island, which belongs to a group of 394 islands known as the Shengsi Islands in the Zhoushan Archipelago. Gothic style is around 13th / 14th century . (1200 / 1300 AD) . Official narrative says 1824. Notre-Dame Basilica (French: Basilique Notre-Dame de Montréal) is a basilica in the historic district of Old Montreal, in Montreal, Quebec, Canada. The church is located at 110 Notre-Dame Street West, at the corner of Saint Sulpice Street. 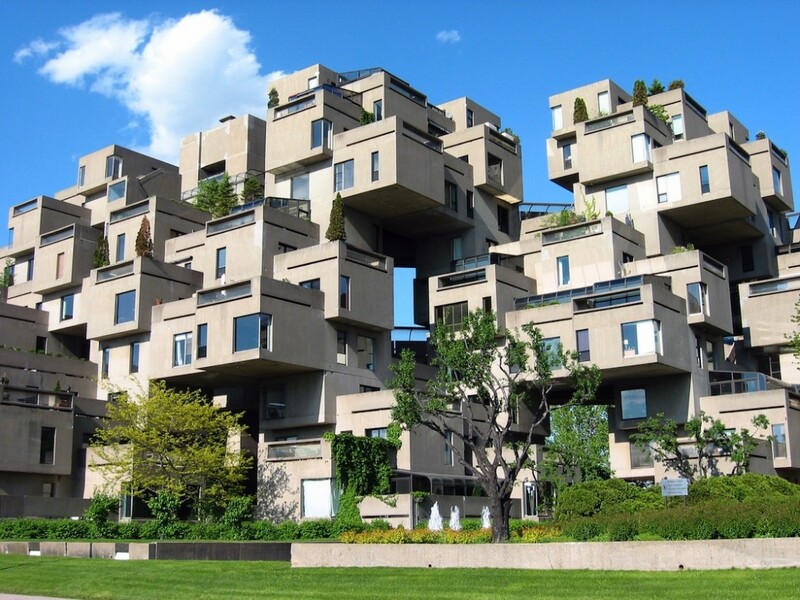 It is located next to the Saint-Sulpice Seminary and faces the Place d’Armes square. A few more in Ottawa, Montreal, Toronto. Official narratives says built early 19th century. A picturesque German island plays host to one of the longest building complexes in Europe; a structure that straddles almost three miles of coast overlooking the Baltic Sea. It is known as the “Colossus of Rügen,” and its identical windows and balconies stretch on as far as the eye can see. 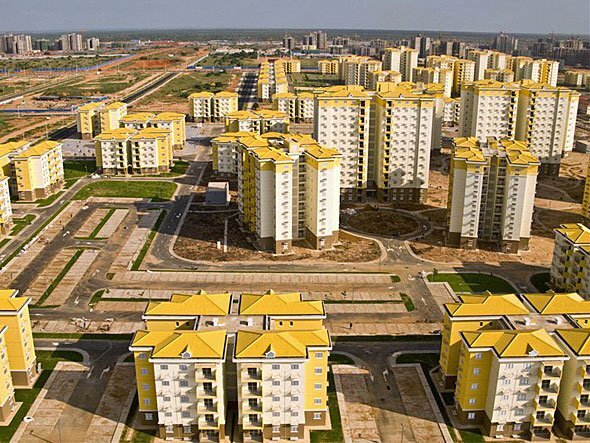 In fact, it was intended to be the biggest holiday resort in the world, having been built to cater for as many as 20,000 visitors at once. Alas, history had something very different in store for it. This island is called Rügen, and it’s located just off the coast of Pomerania in the north of Germany. 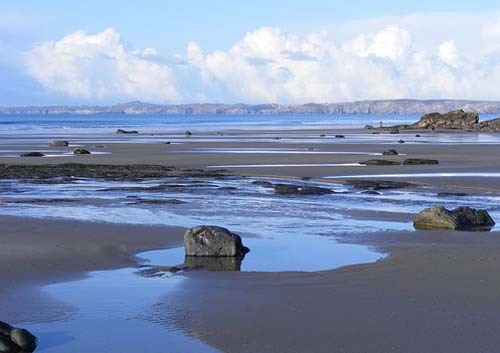 It’s roughly 30 miles long by 20 miles wide, and its variety of expansive beaches, cliffs and scenic landscapes have helped to make it a popular tourist destination for many years. Indeed, most visitors today stay in the kind of quaint holiday apartments or hotels you’d expect to find on a paradise-like island. But if this complex had been a success in the late 1930s, it would have been a very different form of accommodation. It was the idea of a German politician named Robert Ley, who wanted to recreate the concept of affordable holiday camps – such as the U.K.’s Butlins resorts – in his own country. The plan was to create a venue for beachside holidays that was accessible even to low-paid workers, thus helping create a happy and content workforce. 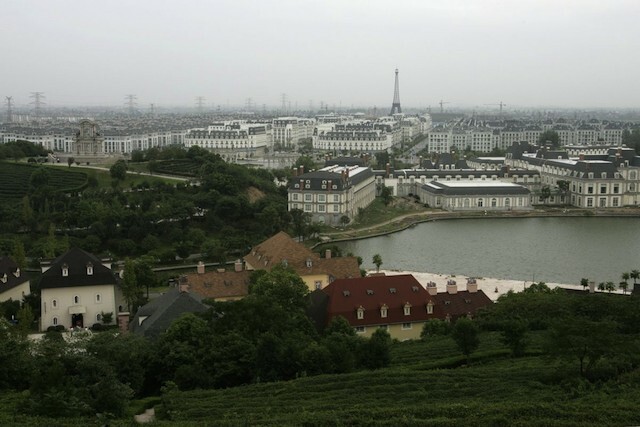 To determine the design of this new resort, then, a competition was held. And, as this was an era in which the Nazi Party held sway in Germany, Albert Speer, Hitler’s foremost architect, oversaw the contest. The winner was one Clemens Klotz. His design for eight monolithic buildings, located just 500 feet from the shoreline, would offer easy access for those wishing to enjoy a relaxing swim. In 1936 construction on the complex, known as Prora, began. Moreover, for the next few years nearly all of the Third Reich’s construction resources were poured into the project. Almost 9,000 people worked on it in some capacity. The buildings were constructed so that each room would offer residents a view of the Baltic Sea. Essential facilities, meanwhile, were located on the other side, with shared bathrooms positioned on each floor. Hitler had big plans for Prora. As well as creating what he hoped would be “the most mighty and large” vacation resort ever built, he planned to add grand touches such as a hall with the capacity to accommodate all 20,000 visitors at once. The Nazi Party’s leisure organization, Kraft der Freude – which translates as “strength through joy” – intended Prora to be the first of a series of similar resorts rolled out across the country. They hoped that affordable vacations would encourage Germans to support them. The buildings would be used as backup military facilities in the event of war. The design for Prora was a popular one at the time, and in 1937 it scooped a Grand Prix award at the Paris World Exposition. But despite such accolades, the resort would never get to reach its glory days. In 1939 Europe was braced for the start of World War II and construction on Prora ground to a halt. Workers were directed elsewhere and the resort remained an unfinished shell. Ten thousand rooms suddenly sat empty, waiting for guests that would never come. The completed structure stretched for nigh-on three miles along the coast. During the war the complex saw sporadic use. When Allied Forces rained down bombs on Hamburg some citizens took refuge there. Later, refugees from East Germany and female members of the Luftwaffe were housed at Prora. In 1945 victorious Soviet forces established a base at Prora and remained there for a decade. When they left they stripped everything of value from the buildings, leaving them in an even more sorry state than before. The newly formed German Democratic Republic’s National People’s Army then took possession of the buildings, and they remained there until German reunification in 1990. As various military units and training facilities moved in and out over the years, Prora’s purpose as a vacation resort seemed to slip further and further away. It wasn’t until 1993 that the complex was abandoned for good. With the exception of one block that was used as a museum, a gallery space and a youth hostel, the rest of the resort began to slowly decay. However, things may finally be on the up for the vacation destination that never was. 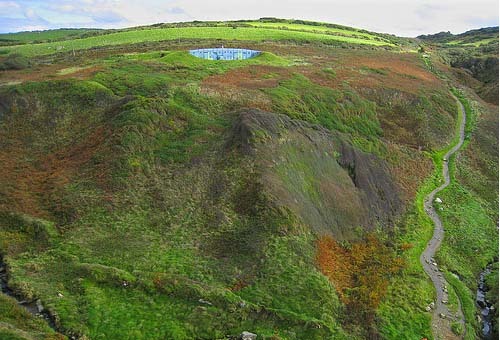 In 2004 a decision was reached to sell the site as individual lots rather than one whole – and the offers began to trickle in. Blocks one and two in the eight-block complex were sold to a company that planned to convert them into accommodation and shops. Block five, meanwhile, was earmarked as the location for a new youth hostel that finally opened in 2011. It now promotes itself as the longest youth hostel in the world. In 2015, more than three quarters of a century after Prora was built, the first tenants moved into the apartments built within the resort’s walls. For the new residents the promise of affordable living by the ocean seems to outweigh whatever sinister feeling might be left over from the ghosts of the buildings’ past. Here is an update by the Author at this site that appears, sadly, at the bottom of the page: “In America, we have a saying that the left hand doesn’t always know what the right hand is doing. 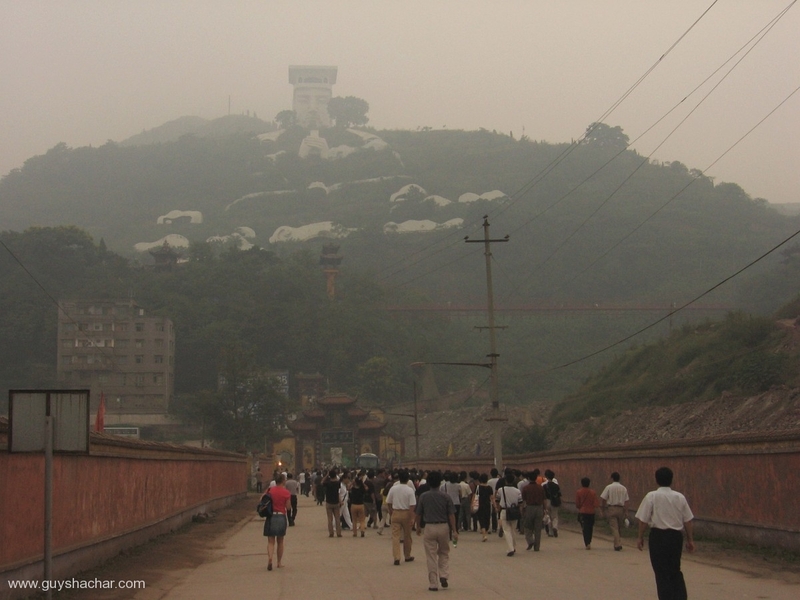 Apparently my original story in January 2007 coincided with many safety improvements being made at Huashan. 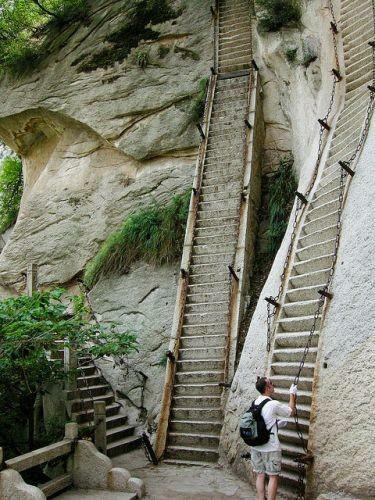 In other words, about the same time that I was scaring Internet readers to death with pictures and stories of the dangers at Huashan, Chinese authorities were making a concerted attempt to make the climb much safer. However I was completely in the dark as to these improvements. Living in Texas, I wasn’t like I could look out the window and notice construction crews up on Huashan. Nor did the Chinese government bother to drop me an email. 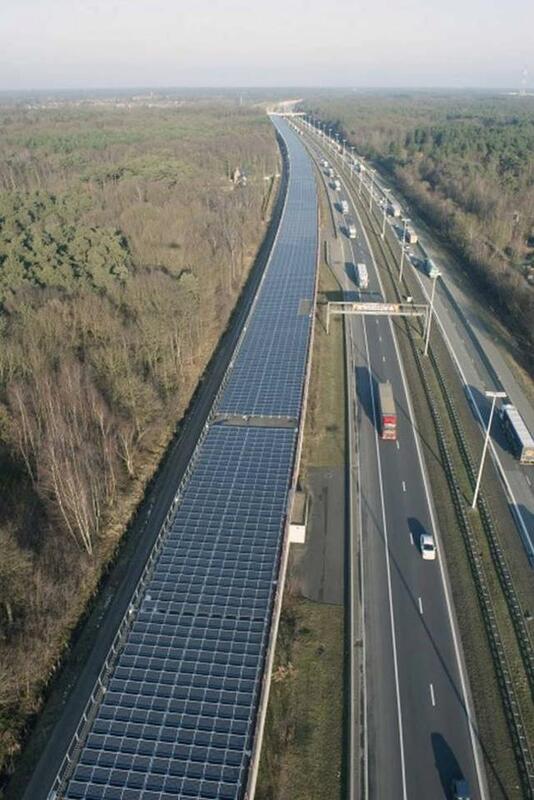 The project, known as the “Solar Tunnel”, is the first of its kind in Europe in that it is the first time the railway infrastructure has been used to generate green energy. The €15.7 million ($21.5 million) project will supply 3300 MWh of electricity annually, enough to power 4,000 trains. High-efficiency solar panels — 16,000 of them, with a rating of 245W each — were turned on, on the roof of a high-speed rail tunnel in Antwerp, Belgium (all of which were supplied by JinkoSolar). The 3.6-kilometer (2.2-mile) tunnel was built to protect trains from falling trees as they pass through an ancient forest. The installation covers a total surface area of 50,000m² (538,000 ft2). The electricity produced by the installation will be used to power railway infrastructure, such as signals, lighting and the heating of stations. It will also power the trains using the Belgian rail network. The endeavor is estimated to reduce CO2 emissions by 2,400 tons per year. You can look through the house to the rugged and beautiful coast of Wales at St. Brides Bay. 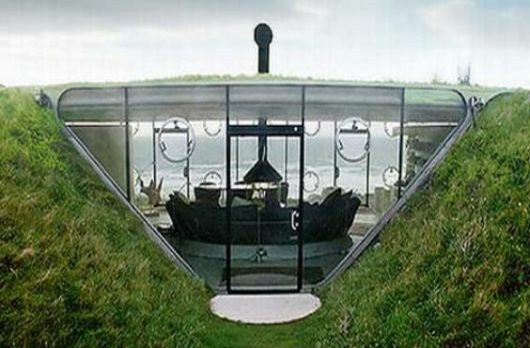 The house is set right into its own man-made mound on the top of the hill. 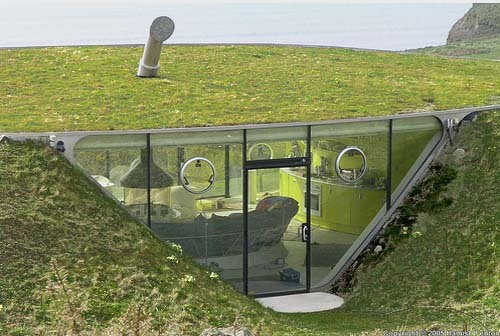 Most of it is underground for passive energy control. The front of the simple Welsh hilltop home is wide open to the view to the coast. 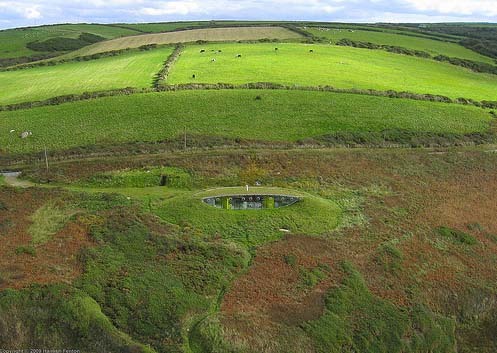 Yet it looks almost organic, set into the hill like a glinting jewel. With no taming of the wilderness around it, the house becomes one with the land. 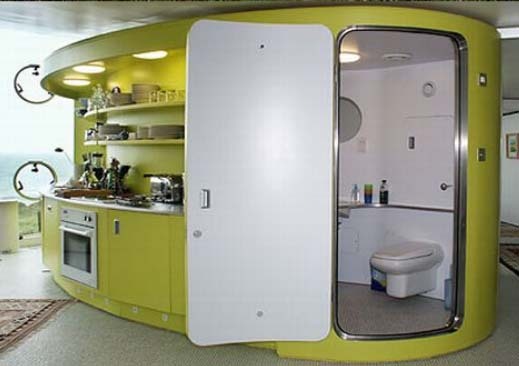 Pods within the house concentrate the plumbing needs into one compact (mass production) unit that has a quaintly humorous and dated air, like a vision of the 21st century from the 19th. Operable windows are round portholes set into the glass on both sides of the house – both the smaller back here, and the much more expansive front, facing the coast.